The Long Reach Long Riders (LRLR) have announced the successful completion of their 11th annual charity motorcycle ride. The ride, which benefits Broadway Cares/Equity Fights AIDS and the PLASA Foundation's Behind the Scenes program, started in Columbia, Maryland on July 12 and ended back in Columbia on July 18th. The total raised to date in 2014 by the LRLR is over $50,500.00. 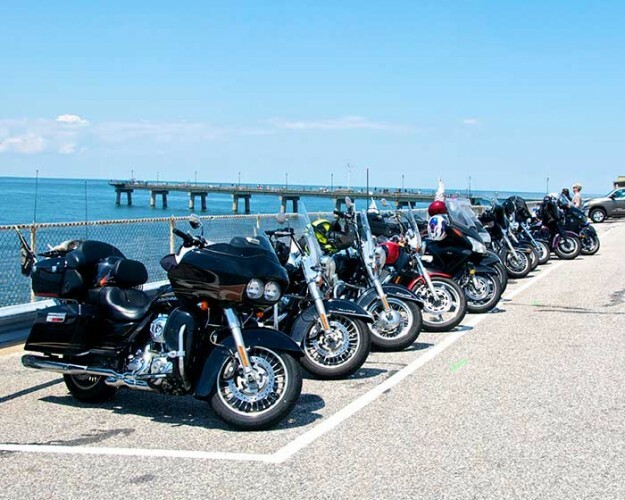 The ride this year included stops at the Flight 93 Memorial in Stoystown, PA and at Appomattox Court House, VA. as well as a jaunt across the Chesapeake Bay Bridge Tunnel. The route also took the riders through the lush farmlands and ranches of Pennsylvania and Virginia and into the mountains of West Virginia. Days 4 & 5 had some of the best twisty bike roads the group has seen in quite some time. 10) Pass out the kazoos when we leave the restaurant, not when we come in. 9) Why does this bottle have barbed wire around it? 8) What’s a “humanitarian break”? 7) Why does Moe have an R and an L taped on the toes of his shoes? 6) Does he know that they’re backward? 5) It’s just a little rain shower. It’ll pass quickly. 4) Gather ‘round for another banner photo. 3) Anyone bring a corkscrew? And the # 1 comment heard on the 2014 Ride. Oh look! A bunny! The ride, which was dubbed Carpe Diem, Carpe Twisty by ride organizers Kacey Coffin and Moe Conn covered over 1,600 miles, during which the chase car drivers passed out over 400 bottles of water, 600 paper towels and countless numbers of Ibuprofen tablets. The Long Reach Long Riders would like to thank everyone who helped make this year's ride a success. Donations are being accepted up to August 31, 2014. Please visit http://lrlr.org/ for more information. The 12th annual (2015) Long Reach Long Rider charity motorcycle ride will take place in the Ozark Mountain region of Tennessee and Arkansas. Ride Marshals Alison "Earth Girl" and Mark "Hobnail" Heiser have tentatively set the ride dates for Saturday, May 30 – Sunday, June 7, 2015. Please check the website in the coming months for updates on the route, registration and donation information.